Pelican is a leading North American canoe manufacturer that uses thermoforming technology and their own proprietary RAM-X multi-layer material. Pelican Ram-X is known for its high impact-resistance as well as being stiffer, stronger & lighter than some other manufacturing methods. Pelican Canadian Canoes were also formerly known as Coleman open Canoes. 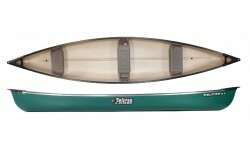 The Pelican 15'5 is an easy to paddle & stable open canoe ideal for beginners & families alike. Constructed from Pelican's Ram X material it is tough yet affordable and easy to handle off the water. We also offer a range of other brands from different manufacturers of Open Canoes.